Terrestrial laser scanning (TLS) surveys were conducted in March 2011 at four LTER (Long Term Ecological Research) study sites in Everglades National Park. TLS measurements are used to construct the vegetation structure and above ground biomass in 4 disparate vegetation communities. The vegetation community is defined by mangrove development and taxonomy at the site. These data are also used to calibrate remote sensing observations from SAR satellites in order to more accurately characterize changes on a regional scale to these ecological types. The study sites are located within the intertidal areas and are only accessible by watercraft. 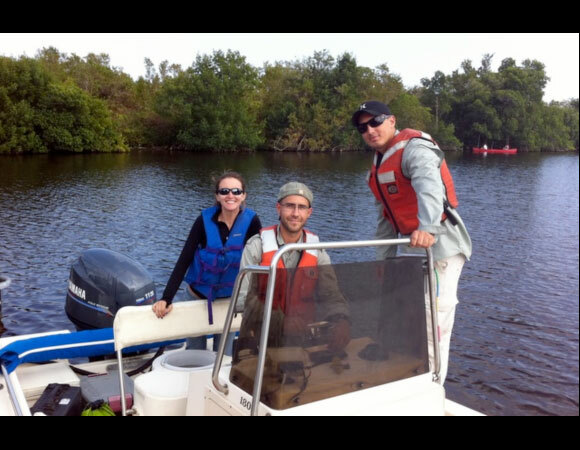 Field work was conducted by researchers from University of Miami, Florida International University and UNAVCO. This is a relatively new technology that will allow satellites to measure ecological changes over time in broad regions. Much of this technology is in place, but data needs to be calibrated and the methodology more fully developed. Projects like this are establishing these processes and opening doors for future research. Figure 1. 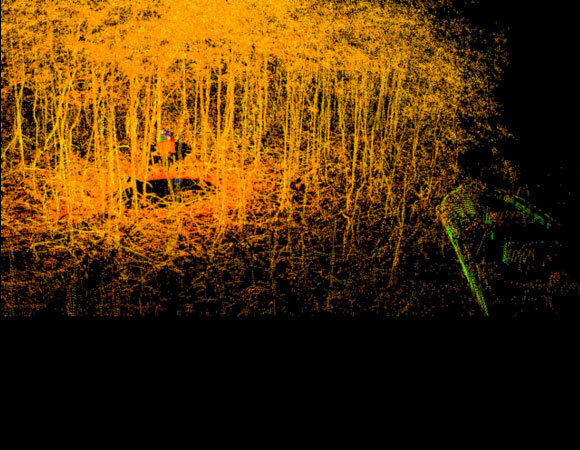 A TLS generated intensity colored point-cloud of one study site in the Everglades. Note the boat outline shows as green. The scanner location is seen as the shadow in center left of the image. Everglades National Park, the largest subtropical wilderness in the United States, boasts rare and endangered species. It has been designated a World Heritage Site, International Biosphere Reserve, and Wetland of International Importance, significant to all people of the world. Its hot and humid environment of the Everglades can make for a long day of work. The sites themselves are about an hour's boat ride from the dock and the sites themselves can be difficult to reach.